Do you own a physiotherapy center? Are you looking for ways to advertise it? This is definitely the article you should be reading now. We will delve deeper about the various marketing ideas and advertising techniques you need to know, guiding you on how to plan a strategy for your physiotherapy business. Like any other business, the aim is to market the business to the persons in need of your business services. In this case, the services are physiotherapy based, like sports and post-surgery physiotherapy etc. Similarly, the physiotherapists prefer online marketing over offline marketing. One of the best examples of physiotherapy centers making use of online marketing is Abhinav Bindra Targeting Performance, a center that connects with its audience online with real stories about the services they provide. With many physiotherapy centers in the market, it is important that you stand out from the crowd. If you are able to reflect how your center will solve the health issues of people by physiotherapy, then you have a fair chance of increasing your visibility by manifold. You need to first determine what it is that you are offering and then categorize who all can be your possible patients. Get an answer as to why people need your physiotherapy services or how they can benefit from it. And then think of ways to market your business. Like any other business, getting your physiotherapy center listed on Google is important. This is a sort of validation that ensures yours is a trustworthy business that the audience can rely on. An online business is incomplete without having a business listing on Google. What goals have you set for your physiotherapy clinic? Have you categorized your goals into short term goals and long term goals? Do you want to provide limited services by your physiotherapy clinic? Or you wish to expand your physiotherapy clinic by providing diverse types of services. Once you know your goals well, you can then think of putting up the right image for your physiotherapy center. This is an important step to complete before you start thinking of ways to market your physiotherapy centre. Not everyone is suffering from the same health issue. Therefore, it is important that you reflect the vast expertise of your physiotherapy center. This could be something as simple as showing your background in the same field. Let’s say you have experience in medical and sports physiotherapy, you could give some references that assure the new users about the level of expertise in your area. Be fully aware of all the physiotherapy services you offer. It is important that you present the main motive and benefit of your physiotherapy center. Try to make the best possible use of your website. Once you have set the basics in place, it is time for you to market and present your center in the best possible way. While talking about promoting, online marketing is the best bet for any sort of business. 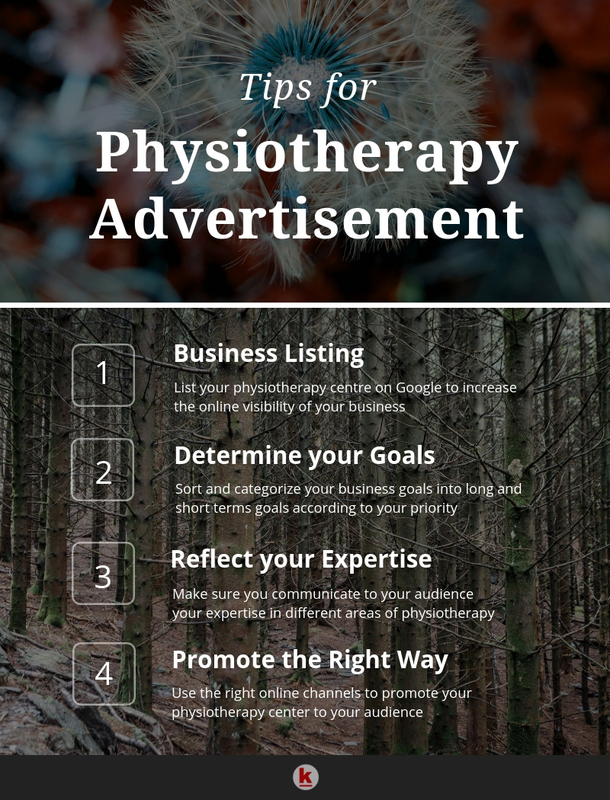 If your physiotherapy center has a local presence, then you could market your business using both offline and online medium. Besides this, social media marketing is also a method to boost up your online presence. For this, you first need to know the pulse of the people who might be in need of physiotherapy services. 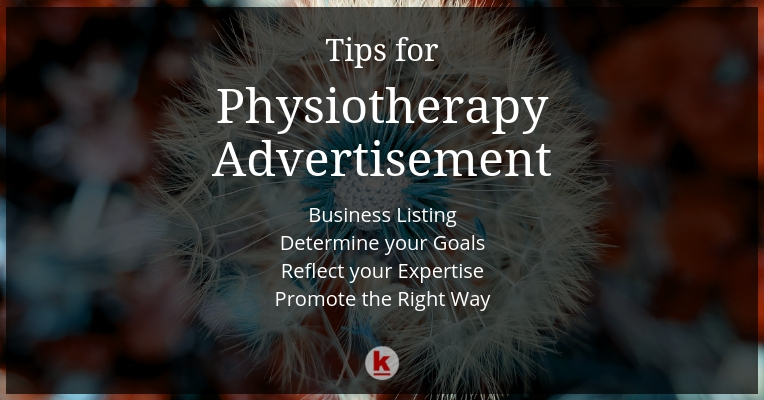 As we wrap up this article, we hope you’re a little more familiar with how to advertise your physiotherapy center successfully. The above-discussed tips will help you develop a plan for your physiotherapy business. However, marketing strategies vary from business to business. We suggest you carry out a little bit of research based on your niche while planning your marketing strategy for your physiotherapy center. Need any assistance for marketing your physiotherapy clinic? Let us know, we can help you!